When Alan Lomax accepted a position as the Assistant in Charge of the Archive of American Folk Song at the Library of Congress in 1936 he became a gatekeeper to the largest repository of recorded traditional music in the country. He subsequently worked to infuse traditional music into mainstream culture and, in so doing, to publicize his interpretation of American culture and society—an interpretation that placed the American people, a category that included racial and ethnic minorities as well as the economically dispossessed and politically disenfranchised, at the center of the nation’s identity. During the 1930s and 1940s he pursued this goal by developing radio programs that highlighted the music of American traditional communities. These included shows designed for children, including Folk Music of America, which aired weekly on CBS radio’s American School of the Air. 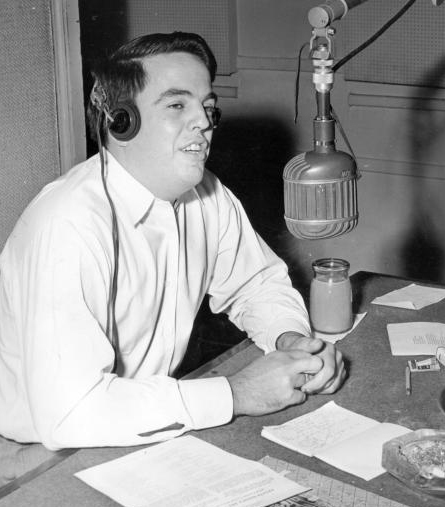 Lomax used this program as a forum to teach children about American cultural and political democracy by highlighting the music of socially, economically, and racially marginalized communities, often including guests from these groups to sing and explain musical traditions on the air. An examination of the principles that motivated Folk Music of America, along with the artists, songs, and commentary that Lomax included, reveals a strong connection between the ideas of cultural pluralism that emerged during the World War I era and popular constructs of Americanism that developed during the later decades of the 20th century. Ultimately, Lomax’s radio work helped to lay the foundation for the multicultural movement that developed during the early 1970s. This according to “Broadcasting diversity: Alan Lomax and multiculturalism” by Rachel C. Donaldson (Journal of popular culture XLVI/1 [February 2013] pp. 59–78). Today would have been Lomax’s 100th birthday! Below, an example of his move to PBS in 1990.